​“In spring 2017, I participated in the spring cleaning for Inner Hope through my church. I met Ken (Inner Hope’s Volunteer Coordinator) and learned about the programs offered here. I really liked what they were doing for the youth and young adults in our local community and I wanted to be a part of it! Christina’s invaluable cooking skills have drawn many young adults to The House for our weekly Young Adult Night. ​Josh is a mentor with Boundless. This past year he was undergoing chemotherapy treatments for a chronic illness. Despite this, Josh began volunteering as a mentor and meeting weekly with a boy in Grade 9. These are his words on what led him to share God’s love through the display of such an extraordinary act. “During my year of recovery, many people supported me. So, seeing that my health was coming back, I thought what better way to use it than by giving it back to others. Inner Hope had a need for mentors so, after praying and seeking God’s direction, I decided it was a great opportunity. I was limited in the number of things that we could do but activities as simple as chatting and eating can be just as fun. ​We welcome Nate and Irene as House Parents! 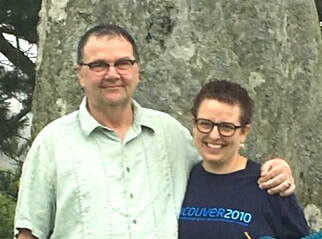 They have both worked with vulnerable populations (those struggling with homelessness, addictions, and mental illness) for several years and had been praying about a new ministry call for some time. Their story is amazing. Nate and Irene actually saw the call for House Parents several months ago. Praying, they felt it would be a great fit, but thought their two dogs who they love, Molly and Unser, would prevent them from taking it. Weeks later, Irene emailed Diana for something unrelated, and Diana miraculously mentioned the position! Irene brought up the dogs, and was assured the dogs would be welcome. Nate and Irene prayed about the position again and knew it really was God’s Plan.